An immutable date-time class that represents an instance in time. This class is designed to hide the horrible implementations of the JDK date and calendar classes, which are being overhauled (and replaced) under JSR-310, which will be based upon Joda-Time. This class serves as a stable migration path toward the new JSR 310 classes. Get the era of this instance in time. Get the day of the month value of this instance in time. Get the day of the week value of this instance in time. Get the day of the year of this instance in time. Get the hour of the day of this instance in time. Get the number of milliseconds from 1970-01-01T00:00Z. Get the number of milliseconds from 1970-01-01T00:00Z with this time converted to UTC. Get the milliseconds of the second value of this instance in time. Get the minute of this instance in time. Get the month of the year of this instance in time. Get the seconds of the minute value of this instance in time. Get the ISO-8601 representation of this instance in time. Get the number of hours that this time zone is offset from UTC. Get the week of the weekyear of this instance in time. Get the year of this century of this instance in time. Get the year of the era of this instance in time. Return whether this date-time is later than the supplied date-time. Return whether this date-time is earlier than the supplied date-time. Return whether this date-time is exactly the the same as the supplied date-time. Subtract the specified about of time in the supplied units. Subtract the specified number of days from this time instant. Subtract the specified number of hours from this time instant. Subtract the specified number of milliseconds from this time instant. Subtract the specified number of minutes from this time instant. Subtract the specified number of months from this time instant. Subtract the specified number of seconds from this time instant. Subtract the specified number of weeks from this time instant. Subtract the specified number of years from this time instant. Add the specified about of time in the supplied units. Add the specified number of days from this time instant. Add the specified number of hours from this time instant. Add the specified number of milliseconds from this time instant. Add the specified number of minutes from this time instant. Add the specified number of months from this time instant. Add the specified number of seconds from this time instant. Add the specified number of weeks from this time instant. Add the specified number of years from this time instant. Get this instance represented as a standard JDK Calendar instance, in the default locale. Get this instance represented as a standard JDK Calendar instance, in the specified locale . 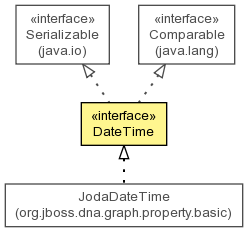 Get this instance represented as a standard JDK Date instance. Get this instance represented as a standard JDK GregorianCalendar instance. Convert this time to the time zone given by the supplied identifier. Convert this time to the same instant in the UTC time zone. Get the number of milliseconds from 1970-01-01T00:00Z. This value is consistent with the JDK Date and Calendar classes. Get the number of milliseconds from 1970-01-01T00:00Z with this time converted to UTC. This value is consistent with the JDK Date and Calendar classes. Get this instance represented as a standard JDK Date instance. Note that this conversion loses the time zone information, as the standard JDK Date does not represent time zones. locale - the locale in which the Calendar instance is desired; may be null if the default locale is to be used. Return whether this date-time is exactly the the same as the supplied date-time. This differs from the equals method in that it can be arbitrarily more strict, checking, for example, not only the logical equivalence of the other date time, but also arbitrary additional fields such as the time zone.